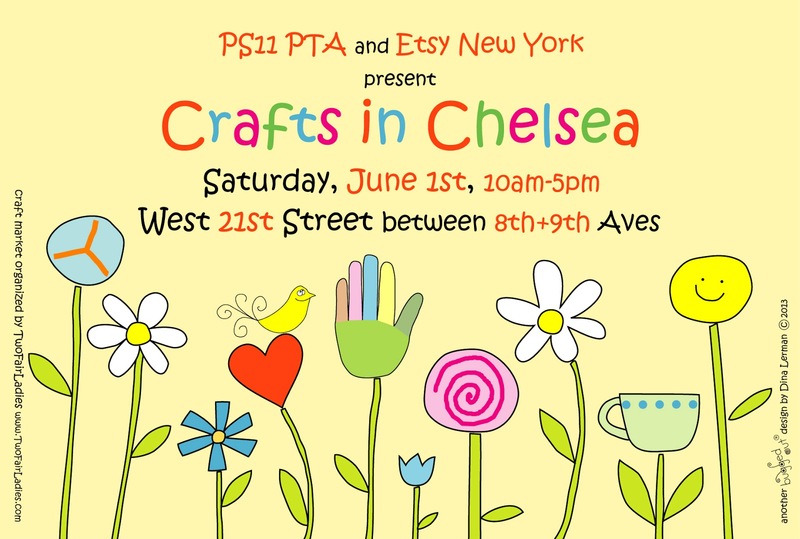 EtsyNY and PS 11 partner to produce the wildly popular biannual Crafts in Chelsea. June's event boasts over 60 vendors of handmade jewelry, clothing and accessories for adults and kids, art, papergoods, housewares, bath and body and more! This family-friendly 100% handmade market benefits PS 11's vital arts programming. From noon-3:00 there will be music and performances, including DJ KAMALA, Bob Marley Cover Band and Capoeira dancers. For those who have attended this event in the past, we look forward to seeing you again! If you've never been, come see what makes Crafts in Chelsea so special! You can find a complete list of vendors at www.TwoFairLadies.com.